This class can update files in FTP server from SubVersion changes. It can retrieve the list of changes done to files and directories in a given SubVersion repository change set. The class can update the added, changed and removed files and directories in a given FTP server to synchronize the files and directories state to specified SubVersion change set. Prize: One downloadable copy of Komodo IDE SubVersion is a popular version control system that is used by many PHP developers to keep track of the changes in the files of their projects. This class provides a solution for deploying the files of a project by retrieving them from a SubVersion repository and sending them to another server using FTP. 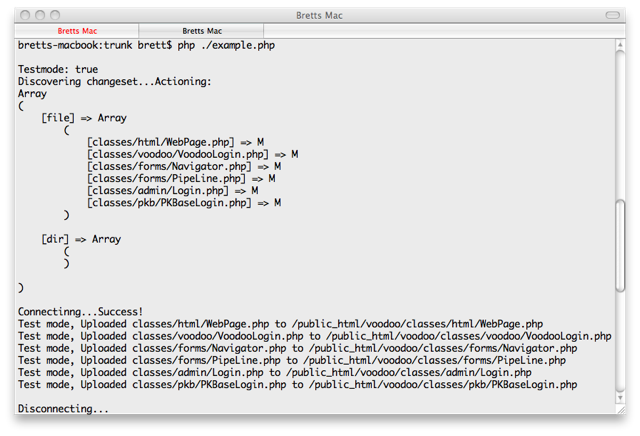 DeployChangeset.php Class DeployChangeset Class - Reads the changeset in current directory and uploads.